Technical SEO is the advanced more complex understanding of how Google indexes, crawls and ranks websites. There are over 200 ranking factors that Google uses to evaluate a website and ranks it accordingly. In short, technical SEO is able to dissect issues, preventing a website from gaining search engine visibility and fixing them. What are Some Common Technical SEO Techniques? Your website load time can become disoriented when a bot crawls your website aggressively and drains your bandwidth. This can hurt your rankings! Check log files and block resources that drain your bandwidth. This is one example of how to use log files to identify issues that can hurt your website health and overall rankings. There is plenty of information available online about log files that can be used to reverse engineer technical server issues. Ever type your brand name in a search engine and find misinformation? This can easily happen when code on your website is incorrect or the search engine is pulling information from another resource it finds more resourceful. 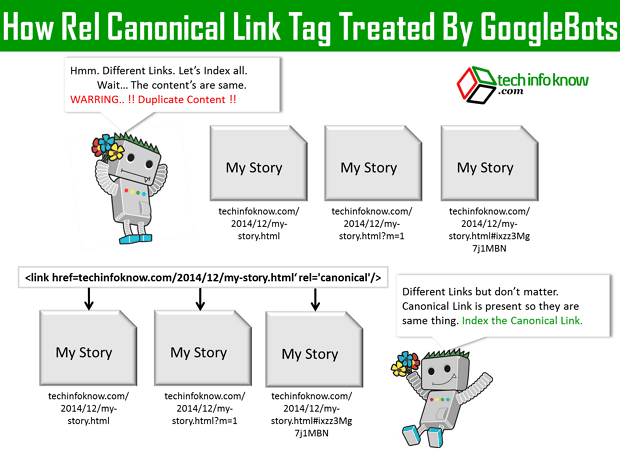 A canonical tag lets search engines know that one page is using information from another page and NOT duplicating it, it lets the search engines know which content is original. Search engines don’t like duplicate content. A page with lots of duplicated content will have trouble ranking due to plagiarisation suspicion or unoriginality. Canonicalization can easily be misused or not used at all. Notice, from the illustration above, each of the 3 URL’s are different, however, people see the pages as the exact same. Add canonical tags to pages that are reusing content or taking content from elsewhere. Site the original content, whether it’s on your site or external. Search engines evaluate links pointing to every website in order to rank each website; backlinks are search engine’s top ranking factor. If you have a lot of links pointing to your website your chances of ranking are better. By reverse engineering, what was done in the past we can figure out what to fix or implement from others. Using a backlinking research tool such as Open Site Explorer, you can run a report on any website. The report will show you who links to the site you’re researching. When looking at this data, one can easily find out a lot about a business. In more competitive industries you will find more links from the top performing sites (especially with a competitive keyword phrase such as “insurance” or “iPhone case”). By researching backlink history on a website you can find out who sends traffic to the website along with other interesting data. In many cases, you can get traffic from these same websites. If the traffic being sent from site A to site B is highly relevant, helpful, entertaining, or educational and you can provide a topically unique angle to the same audience, do it! When you provide users a good experience, search engines present you to similar traffic (that is their goal). In the beginning, early 2000’s, links were the biggest ranking factor (95% of Google and other search engine results were driven by them). If you wanted to rank for a keyword, you would get as many links pointing to your website. Using keywords you want to rank for as your anchor text. If you wanted to rank for the keyword “car insurance”, you would get every site possible to link to your website with the anchored text “car insurance”. Taking any word or phrase in your content and applying a link to it is an anchor text. Over time, people took advantage of links and would buy links, create private blog networks, build spammy directory links and it worked. Google and other search engines became frustrated with people’s manipulations and created penalties to help prevent them. One of the easiest ways for search engines to detect if a website is using manipulated tactics is by looking into a website’s backlink history. Here, I googled “car insurance” and chose the first link that was listed. Then I copied and pasted the URL into Open Site Explorer. In the image above, the backlinks are anchored. In this case, mass.gov and prnewswire.com are linking to Allstate. The word “Allstate” is the anchor text for mass.gov and the word “auto” is the anchor text for prnewswire.com. 10 years ago the ranking site would be different and the anchor text profile would look different. For 2018 and since Google Penguin updates, it’s more important to get branded links over keyword rich links. The best way to gain keyword-rich links is by creating useful content or supporting content internally. In the SEO industry, there is a lot of confusion on what is accepted as a good link, it almost sounds like we shouldn’t use link building as a ranking strategy anymore, everything can be considered manipulation in a sense, right? Wrong, search engines want you to provide a good experience for users when link building. You can get as many links as you want, just be sure to get links that are naturally beneficial to your brand, service or product page. Furthermore, get links that will be clicked on. What Should a Link Profile Look Like? Ideally, we want both. However, the natural link progression of how user link to a brand home page is the brand name itself. There is one caveat though, for internal pages these rules do not apply at all. In fact, internal pages on a site would be more likely to have anchor rich text and URL links than branded links, just look the link profile for an internal Wikipedia page. Using Open Site Explorer from Moz, we can also see the anchor text ration for internal pages. For our case study sake, I searched “Search Engine Optimization” and the second result is Wikipedia. I dropped Wikipedias page into Open Site Explorer and clicked on Anchor Text. Clearly, over 90% of the linking pages have SEO or Search Engine Optimization as the exact match anchor text linking to the page. On a home page, this would look suspicious and spammy. Without a doubt, 90% of the links are branded or URL links. Every SEO blog will have a suggestion for you on proper usages of links and anchor texts, the truth is, it’s all B.S. raises emotions in any way. If you build a lot of links from sites that do not have any audience, search engines will see this as a negative signal and that will impact your results. you can obtain links from a variety of websites. Search engines love to show informative content. Also, they love to rank websites that have diversified link profiles. This is the way to go with technical SEO, it’s both logical and ethical. If you are searching for SEO services to help you rank, we would love the opportunity to work with you.